Your energy needs decrease during a swim taper -- the period before a key meet in which you drop off training significantly to give your body a rest. The result of a taper is stronger, refreshed muscles and a boost in cardiovascular performance for competition. Optimal foods during a swim taper are those that provide adequate energy for the workouts you do conduct, load up your glycogen stores for competition and help your body repair from the rigors of training. Swimming training distance decreases during the taper, so you'll also need to cut back on calories to prevent weight gain and sluggishness. This doesn't mean you should deprive yourself, but be mindful of portion sizes and limit foods with empty calories from sugar and processed fats. Skip junk foods, processed foods and sweets, but don't avoid carbohydrates -- you still need plenty to load up your glycogen, or energy, stores. Healthy carbohydrate options include whole-grain cereals, breads and pasta as well as vegetables and fresh fruit. On the other hand, skimping on calories too much during taper can deprive your body of the energy it needs to restore. Emphasize lean proteins, which provide the amino acids that help facilitate muscle recovery and repair. About 15 percent of your daily calories should come from protein. 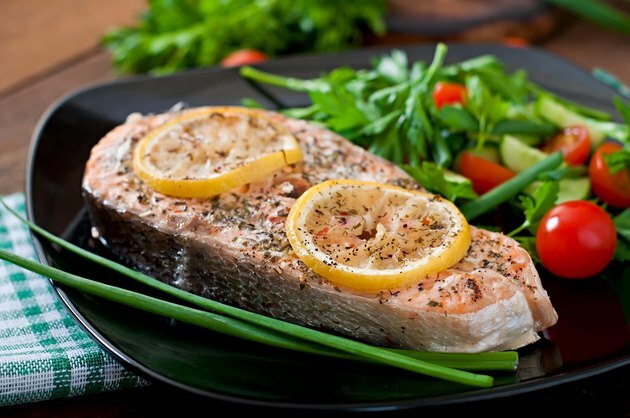 Optimal proteins include fish, white-meat chicken, low-fat dairy, beans and lean cuts of beef. Pair these with fresh green vegetables and a quality starch, such as sweet potatoes or quinoa, to make a complete meal. Avoid salty snacks because excessive sodium causes bloating and dehydration. Instead, go for unsalted nuts, multigrain crackers, peanut butter, air-popped popcorn or fresh fruit. In the three days prior to the meet, consider upping your carbohydrate intake from approximately 60 percent to about 65 percent of your daily calorie intake to top off your glycogen stores. To maintain a calorie balance, cut back a little on fat and protein. Pasta, potatoes, rice and whole-grain bread become a focus at meals. Eat enough so that you are full, but avoid stuffing yourself so that you feel engorged. Stay well-hydrated during taper. Being adequately hydrated helps you optimize carbohydrate stores and ensures you'll perform at your best during competition. Drink before and after workouts, even short ones, because you lose fluids through sweat when you swim. Aim for a urine color that is pale yellow to ensure you're drinking enough. Although sports drinks can help you reach proper hydration status, emphasize water as your primary fluid source. NB Swim: What Is Taper and How Do I Get the Most Out of It?